In the small 30 to 60-seat turboprop market – and in direct competition with local project the modernised Ilyushin IL-114 – Russia is considering the development of a 40-seat regional turboprop aircraft based on the 30-year old Let L-610, a prototype aircraft originally developed by the Czech civil aircraft manufacturer Let Kunovice. The state is considering replacing the obsolete Soviet/Ukrainian An-24/26s, some 60 of which are still operational across the country, Russian Aviation Insider understands. The new aircraft is likely to be based on the Let L-610 platform, which was created in Czechoslovakia. The twin-engine turboprop made its maiden flight in December 1988. Russia’s Ministry for industry and trade believes the new product can fill the niche between the 19-seat L-410UVP-E20 and the 60-seat Ilyushin 114-300. The L-410UVP-E20 was also developed and produced by Let Kunovice, which was renamed Aircraft Industries once it became a subsidiary of Russia’s Ural Mining and Metallurgical Company (UMMC) in 2008. Over the last two years, media attention – ignited by governmental interest and some state comments surrounding the L-610 – has been gaining momentum. It was, for example, described as a ‘prospective project’ in the roadmap for the development of the so-called Titanium Valley – a special economic zone near Yekaterinburg, an initiative which was announced in 2016 by Evgeny Kuyvashev, the governor of Sverdlovsk Region. Oleg Bocharov, the nation’s deputy minister for industry and trade, meanwhile delivered a speech unequivocally confirming the government’s commitment to the L-610 design, whilst addressing delegates at a recent government-supported Transport Week forum in Moscow, which included officials from the Ministry of Transport and Rosaviatsiya, the Russian aviation authority. “We understand that we are ready to purchase the [design and production] documentation for the L-610 from its Russian owners, and try to develop a 40-seat aircraft so that, in a five-year time period, [the aircraft] would enter service [filling the gap] between L-410 and the IL-114[-300] to enter the service by the end of 2021,” he declared. As Aircraft Industries is now fully owned by UMMC, the documents for the model are already formally in Russian hands. 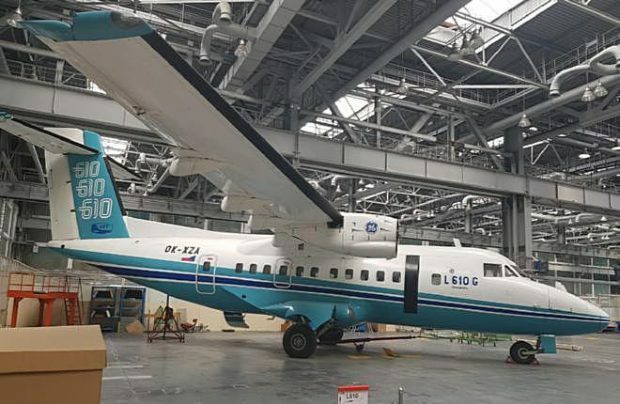 The deputy minister for industry and trade also highlighted the high-wing configuration of the L-610, which may be a good option for those carriers that are dubious about the low-winged IL-114 being an adequate replacement for a high-wing An-24 at secondary airports. Russian Aviation Insider has been assured by one of its sources close to Aircraft Industries that the documentation for the L-610 has been preserved intact and launching serial production would not require a tremendous effort, provided sufficient funding is in place. Utilising the ‘off the shelf’ L-610 as a base for a new design could save between three and four years of development compared with starting such a project from scratch, notes the source. Meanwhile, an executive of one of Russia’s regional carriers has told Russian Aviation Insider that the L-610 is a ‘sound solution’ for replacing the Antonov An-24 turboprops and Yakovlev Yak-40 tri-jets, and that a 40-seat aircraft may be a more appealing prospect than a 50-seater. Secondly, proposing a 40-seater aircraft to regional airlines will trim the demand for a slightly bigger IL-114-300, further shrinking its serial production numbers value, a development which will result in higher unit costs and more expensive after-sales support. The plans for resuscitating the L-610 may indicate implicit problems with the IL-114 upgrade effort, another Russian Aviation Insider source suggests. Finally, is the question: if the L-610 is expected to be produced by Ural Works of Civil Aviation (usually referred to by the Russian acronym UZGA), which is currently responsible for licensing production in Russia of its smaller sibling the L-410, who is backing this private enterprise, which is trying to fulfill a special role in the Russian aerospace industry? Ural Works is not even formally declared as a part of United Aircraft Corporation (UAC) and its newly-appointed parent Rostec, and any mention of UZGA is hard to find on either Rostec’s or UAC’s websites. UZGA’s own website places Rostec modestly among partners, along with Ural Trade and Industry Chamber etc.